Migrating to the cloud? Get your team trained in the AWS Cloud Skills they’ll need to innovate and drive transformation. 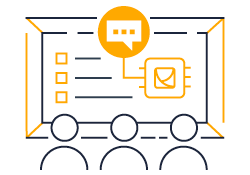 Faster innovation, happier customers, and greater efficiency starts here—with an in-depth AWS Cloud skills training for your team. With private onsite training, your team can learn from an instructor who comes directly to your location and who is familiar with your AWS use cases. Use this form to reach AWS Training and Certification to request more information on private training opportunities. Our team will typically follow up with you within 48 business hours.